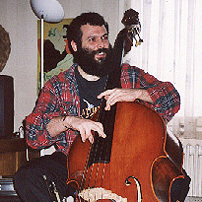 Double-bass player Sebastién Dubé was born in the Quebec province of Canada and has lived in Sweden for many years. He has his background in classical music and has played with several well-established orchestras in Canada, USA and the Nordic countries. His interests also lie in jazz and beat music as well as the traditional fiddler music of Sweden.